The Premium Tahoe includes a tempered glass view window and a four-piece log set, mounted atop our legendary Slope Glaze Burner for a rich flame pattern within a taller, deeper log stack that complements the deeper fireplace (20 inches). Premium Tahoes are offered in Millivolt models (with standing pilot), in Intermittent Pilot models (requires 120V to operate), and in Multi-Function models. Our Green Earth Preferred IP and Multi-Function Remote models eliminate the standing pilot for even greater efficiency and energy savings. Multi-Function models include a thermostat remote control that automatically varies flame height and blower speed to maintain your pre-set temperature. The models can operate with a standing pilot, to provide heat during a power outage. 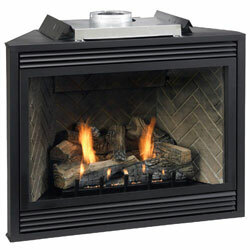 Review: I ordered this fireplace on a Tuesday and it shipped the very next day. The freight company called to set up a delivery time and the order was delivered in pristine condition. All in all, a great and very easy transaction!